The next phase of the To Teach Who Christ Is campaign, now that the doors are completed, is our church sound system. We had hoped that could be updated by Easter, but early summer is probably more realistic. Thank you again to those who have been so generous. If you have not made an offering, please feel free to do so, simply to St. Linus. As you can notice, progress is definitely being made on new entrances. Many have commented in a positive way regarding the ramp on the east door. We will be looking at a way to retain that feature. The current ramp is only temporary. Also, there is a plan in works to 'update' the interior of the adoration chapel. This plan will be announced in the spring. The money for these projects is through the generosity of the To Teach Who Christ Is donors and a few others. Thank you! Shown below are revised architectural renderings of the new vestibules for the Northwest entries of both the Church and Adoration Chapel. Due to cost considerations, the outdoor canopy connecting the two vestibules was removed. Each vestibule will be ADA compliant with automatic doors and a “sloped” access to the parking lot thereby eliminating the curb. Work is scheduled to begin in mid July with a projected completion date in October. To maintain safety, there may be periodic closures of these two doorways during construction. Project updates will be printed in the bulletin. If you should have any questions, please contact the Business Manager at the rectory. St. Linus Parish participated in the "To Teach Who Christ Is" Campaign to benefit the ministries of both the Archdiocese and our Parish. One project that was decided for our parish is the construction of a new, handicap accessible, covered entryway / vestibule for the Northwest church entrance. This entryway / vestibule would also incorporate the entrance of the Adoration Chapel. The new entryway will be convered and each entry will have handicap automatic doors and a heated vestibule. The exterior design mimics the existing church entrances with the same style flagstone. Existing stained glass windows presently in the church sacristy will be installed in the new entryway. The windows depict the seven sacraments. Architectural renderings are shown below to give you and idea of what the new entryway / vestibule will look like when completed. It is anticipated that work on this project will be starting soon with a spring completion date. Please know that this project is attributed to the extreme generosity of the parishioners of St. Linus Parish who participated in the campaign. As of today, over $350,000.00 has been collected! We will keep you apprised of the project status in the future. 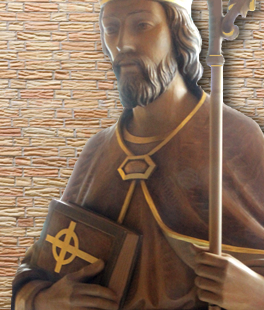 On behalf of the faith community of St. Linus, thank you for your support and generosity. The To Teach Who Christ Is Campaign continues in the hope we can reach the goal set by the Archdiocese of Chicago. As of July 6, 2016 we were at $805,223 pledged. If all of the approximately 300 people who said they would think about it, gave $500.00 then we would raise an additional $150,000... which is close to the goal!! So, think it over… We know it is a lot to ask, and we don’t like asking!! Thank you for all your support. If you have any general questions about your pledge or haven’t received anything, contact the campaign office at 312-534-8500.